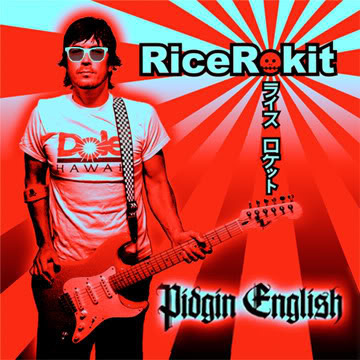 RiceRokit--one of The Duff Guide to Ska's fave bands--is in the process of putting the final touches on tracks for its sophomore album, Pidgin English (Megalith Records). Main man Kendo has been kind enough to send a few rough mixes our way--and we've been blown away by what we've heard so far. While their brilliant debut album Hang Loose (DGTS grade: A) was full of originals, Pidgin English is mostly comprised of covers, reflecting Kendo's passion for both New Wave and 80s rawk. Bauhaus' "Bela Lugosi's Dead," a dubby, percussive track to begin with, is given a ska revamp, which feels so right and good that you wonder why a ska band hasn't done this before (and it's right in line with Kendo's horror movie obsession). RiceRokit's version of Echo & the Bunnymen's "Lips Like Sugar" is incredible in that it's a recognizable (and faithful and loving) cover of this song, but they completely own it--it's definitely a Kendo and the Bunnymen tune! Other covers include a great interpretation of Rufus Thomas' "Walking the Dog" (which both The Rolling Stones and Aerosmith included on their debut LPs), and Tom Petty and the Heartbreakers' "You Got Lucky." Sadly, the one track that won't see an official release (since a certain major label wouldn't go for it) is a mash-up of Diamond David Lee Roth's vocals from Van Halen's "Runnin' with the Devil" and RiceRokit's ska instrumental version of the song. You can listen to it on RiceRokit's MySpace page--this version will embed itself in your cranium and refuse to leave (check out the cool "Fast Times at Ridgemont High" sample!). Simply awesome. I'll be playing several of these new RiceRokit cuts at the N.Y. Beat: Hit and Run 25th Anniversary Reunion party on April 10th at the Dusk Lounge in NYC. I'm deejaying the event and will be set up in the very back of the bar...come by and say hi if you're planning to be there! You want the global perspective on the state of ska music right now? Then check out Gabe Pressure's terrific 40-minute podcast interview with Bucket up on Musical Occupation. Some of it is fascinating (the fact that after 25+ years and 5,000 gigs The Toasters are still finding new venues to play, in places like Northern California or Turkey); some of it is depressing (the likelihood of a new Toasters album in the near future is close to nil, as sales of recorded music are practically non-existent due to piracy); all of it is compelling! I've been reading gig previews, band interviews, and album reviews related to The Toasters since the late 80s (back when Xeroxed 'zines roamed the planet). So, I'm always a little excited when a piece is not a rehash of the press release, covers some new ground, and is well written, like this one. One of the neat aspects of this program is that you can play your virtual horn along with any song in your iTunes library (which, in a way, is much cooler than anything you can do on Guitar Hero). Time to work on "Guns of Navarone!" Ever since 2 Tone was tagged as a "ska revival" movement in the late 70s, each subsequent wave of ska has been burdened with this albatross around its neck. While it probably didn't help that so many of the 2 Tone acts expressed their sincere love of their influences so prominently in their set lists and on their LPs, people like Jerry Dammers, Mike Barson, and Dave Wakeling heard Prince Buster, Laurel Aitken, and many more extraordinary JA musicians as they grew up along side the sons and daughters of Jamaican immigrants. Ska and reggae had become an integral part of the empire of British pop culture, as England absorbed the music and styles of the peoples of its former colonies--so questions of legitimacy or cultural appropriation were never an issue (particularly when many of the 2 Tone bands were multi-racial and The Beat could boast of Saxa in their ranks). Respect was due to the originators, even as their songs were being transformed by the fury of the times and the power of punk. Yet an over-reliance on (admittedly brilliant) ska covers on all of their debut LPs--which helped launch the bands to the Top of the Pops--left the 2 Tone bands open to accusations of creative shortcoming in the songwriting department (something that certainly was not an issue on follow-up albums by The Specials, The Beat, and Madness). So, yes, 2 Tone may have started out as as a ska revival, but a lot of distance was covered from "A Message to You, Rudy" to "Ghost Town"--and at by end, the sound and style was all their own. But this informed and nuanced view of 2 Tone never made it across the Atlantic whole. Most mainstream music critics in the US have been all too willing to sneeringly dismiss the scene as somehow illegitimate--failing to see that 2 Tone, the third wave of the late 80s and 90s, and whatever we want to call what is going on today as the organic evolution of this genre of music, developing in new ways as it is re-interpreted by successive generations of musicians around the world. Interestingly enough, the questions of musical authenticity or musical/cultural appropriation generally don't dog rock bands using/exploring/recycling blues riffs or punk bands doing the Class of '77 ad nauseum. But ska is shunted off to its own musical ghetto--and maybe its better this way. Most people don't know what to do with it. Perhaps because those in the current ska scene are somewhat touchy about questions of ska's lineage (though their affection and respect are never in doubt), many traditional bands are almost fanatical about authentically re-creating the particular style of Jamaican music they love. While I'm generally more intrigued by acts which bring something new to a specific musical form, the groups with the talent and skills to faithfully realize a specific vintage ska sound and compose new songs in that style--without succumbing to shoddy imitation or parody--are really worth hearing. 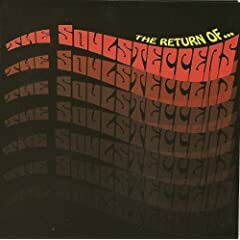 A fairly recent album by a band in this category (that seemed to slip under the radar) is Return of the Soulsteppers by Bakersfield, California's The Soulsteppers, who are remarkably similar in sound and quality to the cream of the skinhead reggae crop: The Upsetters, Laurel Aitken, Harry J All Stars, Dave Barker & Ansell Collins, Clancy Eccles, Lloyd Charmers, Symarip, and The Pioneers, among others. After first listening to The Return of the Soulsteppers, I was also reminded of the two King Hammond records that Bad Manners' Nicky Welsh lovingly created (if, at times, a bit tongue in cheek), Revolution 70 and Blow Your Mind, in the late 80s/early 90s (the story goes that when the debut King Hammond album was released, they actually passed some of them off to unsuspecting record store owners as a long-lost skinhead reggae classic--it's that good). Indeed, The Soulsteppers are in good company. While this mostly instrumental album is simply excellent from start to finish, highlights include (and note the extraordinary attention to detail in the production of the album--the instruments used, the recording process--it sounds like a 60s-era gem) "Warhead," with its choppy, propulsive Hammond organ and human-made groans and roars; the bass-heavy, orgasmic (le petit mort?) "Death Comes"; the ethereal flute melody floating through "Soul Step"; the soulfully sung love song "The Feeling is Real"; the jaunty "On That Evening"; "Last Laugh's" lazy, dubby trombone line contrasting with its frenetic guitar and melodica; the amazing steel drums featured in "Basson"; "Mars Invasion's" updating of "Skinhead Moonstomp"--"Cause they've already gone to the Moon/So the skinheads are going to Mars"; the sweet, romantic-sounding sax of "The Park"; and the electric piano melody leading the rhythm section forward on a march through "Death Valley"--with a reverb-y sound effect that's the aural equivalent of the sun baking your brain in your skull. Cool stuff! The album's sparse liner notes indicate that the tunes here were composed between 2002-2008 (and several tracks were previously released on 7" singles on the European Lava and Conquering Ruler labels) and from what is captured on The Return of the Soulsteppers, it was clearly worth the wait! The rest of the world might not know what to make of The Soulsteppers--or skinhead reggae, for that matter--but if you're in the know, you'll definitely want this record. Wouldn't you know it? I just received large vinyl shipments from The Amphetameanies (thanks, Gordy!) and Jump Up! Records (thanks, Chuck!) and my wife accidentally sits on my turntable (don't ask--though it's not her fault), busting it. Nothing appears to be broken on the outside, but now it won't play 45s or LPs at the right speeds...(my portable record player was a cheapie, so it's no great loss, but now I gotta go find another one, 'cause I'm jonesing to hear me some of this new wax). Spring Heeled Jack Are Back! There have been rumors floating around about this for a couple of months now, but it is finally confirmed: Spring Heeled Jack will be playing for the first time since their 2002 tribute show in honor of drummer and SHJ co-founder Dave Karcich, who tragically died of a brain aneurysm at the age of 28. You can catch SHJ on May 7 at Toad's Place in New Haven, CT. In conjunction with this gig, the band's two albums, Static World View and Songs from Suburbia are being reissued on limited edition vinyl runs of 500 copies each by Asbestos Records. 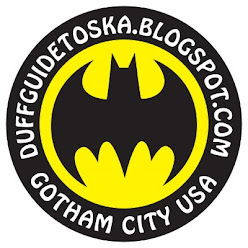 Duff Review: The Stress - Muk! Muk! Back in the early 90s, before we had kids, my wife and I would sometimes scrape together enough cash to rent a car and spend a week on Cape Cod at a motel outside of Provincetown. Just before we would head off on our vacation, my father-in-law would always half-jokingly warn us not to stop in Providence, Rhode Island. This from a big Irish NYC public school teacher who taught high school in the Bronx (and I ain't talking Riverdale here). Kids hanging on the street there often assumed he was a plainclothes detective instead of the educator/performance artist he is (they would stage-whisper "Five-oh"--slang for cop--when he passed by). So what possible connection does the aforementioned story have to do with The Stress? Well, they both have a Providence connection (the band calls it home) and are about things not being as they seem. 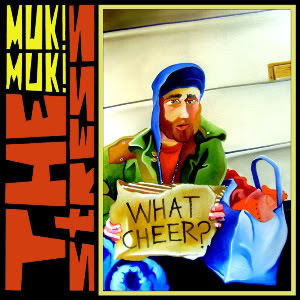 The Stress are a wonderfully gifted rocksteady group that has a knack for creating catchy, memorable, and upbeat tunes that one might assume are perfect for wasting a day at the beach, or simply getting wasted--you know, good time music (and it is). But focus in on the (biting) lyrics and you'll discover that the songs on this EP are about crushed dreams; economic and social injustice; the hell of other people; and the terrible awareness that death is waiting in the wings for all of us, either as a release from unbearable suffering or an inevitability to outrun as long as possible, in the slimmest of hopes that we can realize our dreams before our time's up. This is rocksteady with an edge. Ostensibly, "What Cheer?" is concerned with a homeless man who is struggling not freeze to death on the street, while simultaneously wishing for a release from all his misery. But the song is also a commentary on the extraordinary materialism, excess, and greed of our society--as best displayed at Christmas time--that ignores all the desperate people in poverty in its midst (and one could argue, misses the complete message of the season): "I remember being a boy and all that Christmas joy, but now it's all gone away/And as the temperature drops, no one stops, but the shops are cashing in all day/Hoping that something will keep me warm through the night, so I'll see the morning sky/And at the end there's not a friend by my side, tonight's the night that I die/Take my soul/Take my soul/Take my soul." (And there's the second death reference.) It's a gorgeous tune, all the more so in contrast with its desperate lyrics. And the jingle bells ringing through some of this track are a nice ironic touch. How often have you heard a rocksteady song (or really any type of song) about NAFTA? The reggae-ish "1994" imagines the impact of this trade agreement on poor farmers in Central America, struggling to survive a system that is rigged against them: "I walked through the hills of my father's land/I washed all the dirt and the blood off my hands/I've watched as this life's made my mother cry/I've watched as the government rolled right over me." Yet where there is life and struggle, there is hope for a better day: "And today we're still farmers and we work just as before/And we wait as we toil for a justice without war/Justice without war..."
The mid-tempo ska track "Bridges" is a clear-eyed assessment of all the relationships in one's life (some you wanna take, some you wanna leave behind: "I've burned bridges before/But I've put fires out/I'm not a dreamer"), while the country-ish, live 'n' lo-fi "Can't Stand Another Day" is a bitter, scathing kiss-off ("Oh, won't you go away?/It's killing me to stay with you/So blue..."--our third death reference, even if it's metaphoric). There is no excuse not to have The Stress in your collection (for Pete's sake, this is a free EP!). Listen to them everyday! Highly, highly recommended. Second NYC Specials Show Added for April 20! Due to the unsurprisingly strong response to The Specials' April 21st gig at Terminal 5 (which I understand sold out in its pre-sale), a second gig has been added for Tuesday, April 20th at 8:00 pm. Tickets go on sale for this show on Friday, February 19 at noon. Make sure to go to The Specials' website to sign-up for their pre-sale for this show (it's not up yet, but they did this for the 4/21 gig). Hope you get 'em if you want 'em! As faithful Duff Guide to Ska readers are all too aware, I am completely enamored of the British music magazine MOJO, partially because I am huge fan of Brit-pop, punk (class of '77), and post-punk/new wave and they give bands from these genres lots of coverage--and MOJO is pretty much the only mainstream music magazine to devote some ink to ska and reggae on a regular basis (admittedly, it is usually reserved for 2 Tone era acts or re-issues of extraordinary Jamaican releases--but they LOVED Madness' The Liberty of Norton Folgate and reviewed Pama International's new album in the last issue). Plus, there are so few decent music magazines left that have so much good content and are a pleasure to read. I doff my hat to the whole crew at MOJO. They're also smart..from day one they've kept the vast majority of their content off-line, so if you want to read a feature or review, you have to buy the magazine or have a subscription to it (or thumb through it at the newsstand)--they didn't eliminate one of their key sources of income like so many other print outlets. Having said that, picking it up in the US is costly, $10 an issue (though you get a CD of music relating to a theme or band). They just started offering subscriptions in America, which I may do, as I will end up saving some cash: $80 vs. $120. - Madness' Chas Smash is working on a dubstep album called Chas Smash's HiFi Sounds of the New Boss. - MOJO's "Time Machine" feature--this month in 1964--notes that on February 8, Blue Beat co-owner Siggy Jackson was quoted talking about the reasons why he started issuing releases from Jamaican artists like Laurel Aitken and Derrick Morgan--plus two of the top-selling Blue Beat singles in London are Prince Buster's "Madness" and The Folks Brothers' "Carolina." - Pressure Sounds' reissue of King Tubby & The Clancy Eccles All Stars' Sound System International Dub LP is reviewed and receives four stars. - A feature on The Ruts DC's one record (Animal Now) recorded after their lead singer Malcolm Owen overdosed on heroin, notes that the band had backed Laurel Aitken for a spell in 1980. - And you should check out the amazing excerpt of the new bio of Ian Dury by Will Birch (titled "Ian Dury: The Definitive Biography") simply because it's a good read. Special NYC dub forces Dub Is A Weapon will be playing an extra-long set at Sullivan Hall on Saturday, February 13 at 9:00 pm sharp--at another show in honor of Bob Marley's 65th birthday (2/6/45). Also on the bill are Cali reggae crew Groundation, who will be playing Bob, Bob, and nothing but Bob. plus late-night Version City All-Star Bob Marley Tribute Jam Session! 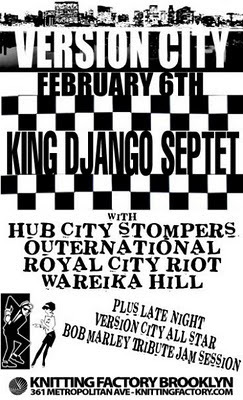 I keep hearing rumors that sometime this February there will be a big NYC ska benefit for Haiti (apart from the one that The Hard Times just participated in at the Bowery Poetry Club)...anyone have the scoop? The Specials Gig at Terminal 5 is a Go! The Specials show at Terminal 5 is back on for April 21. Tickets go on sale 2/17 at noon (and I assume there will be a pre-sale). The Specials Nite Klubbing in NYC? Bryan at ReadJunk reports that The Specials' website now lists all of the gigs the band will play on their mini-tour of North America in April--including the NYC date on 4/21 at Terminal 5. However, if you check the Terminal 5 site, the show is not listed (actually, they have nothing listed for that night, so it appears that the show could still take place)--and there is no word about when tickets might go on sale.